As the world’s best selling rotor tillers, Mantis tillers/cultivators are lightweight little machines that range from 20 to 24 pounds. 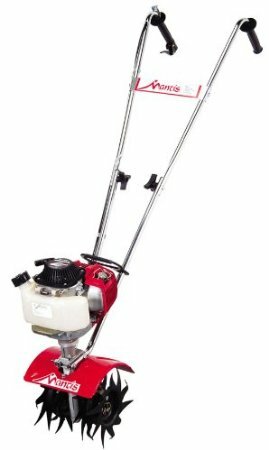 Great for breaking new ground, till beds, weed, cultivate and more, a Mantis tiller/cultivator will help you do gardening and landscaping chores, regardless of your garden is large or small. Mantis tillers are able to cultivate the tough soil and remove weeds between rows of flowers or vegetables, providing a better growth environment for your plants. Equipped with a powerful engine, durable tines and compact profile, the Mantis 7225-00-02 Two-Cycle Gas-Powered Tiller/Cultivator is great for tilling in narrow rows and raised beds, or creating new gardens. The Mantis Tiller/Cultivator will be your good assistant no matter you are a beginner to break through new ground or a gardener. 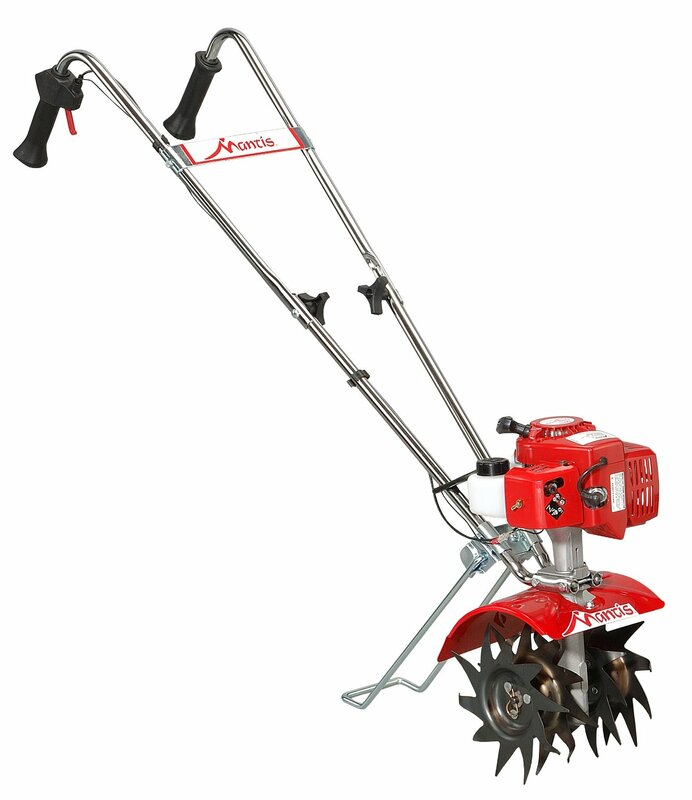 This Mantis Tiller/Cultivator weighs a mere 24 pounds and has a width of only nine inches. 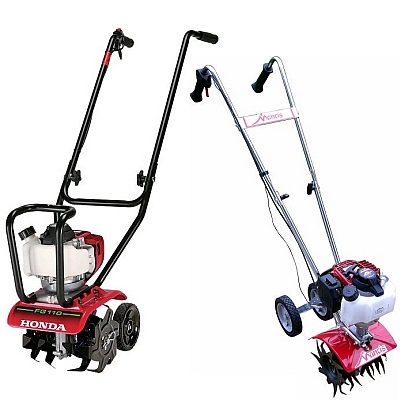 But never underestimate its power because of its light weight, it features four-cycle, commercial-grade, 25-cc Honda gas engine, making it powerful enough to maintain your garden. It is convenient to store it in a garage or tool shed with its folding handle bars. Known for its powerful commercial power and light weight, this Mantis features a 21.2 cc Echo engine and weighs only 20 lb. 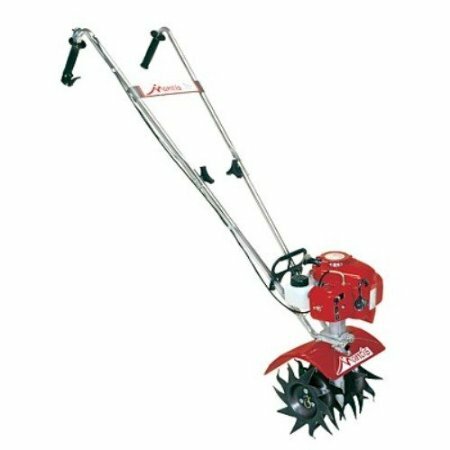 The small tiller head is able to chop through the tough sod down to 10″ deep. It also features speed control and shut-off switch at your fingertips. The braced and balanced handlebars and cushioned shock absorbing grips make it easier to break ground. 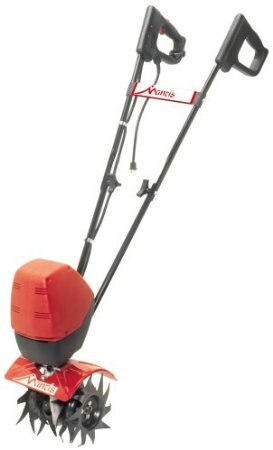 Get your gardening chores done efficiently and quietly with this Mantis Electric Tiller/Cultivator. This tiller is easy to maneuver narrow rows and along fences thanks to its compact design. It also includes a Border Edger Attachment and Kickstand, a Plow, Planter\Furrower and Lawn Dethatcher. This tiller is very easy to start. You just need to plug the unit in a pulling the trigger to start the powerful and clean electric motor. It weights only 21 pounds, making the Mantis Electric Tiller easy to carry and maneuver. It can get into tight spaces where larger tillers cannot go with its compact design. The patented reversible tines are able to till down 10 inches.